I have been debating whether or not I should put this up, however after much testing I have concluded that it is safe, it works and many other people have used this method, it goes without saying that this is still quite dangerous to do as nobody knows why D-Link doesn’t allow the downgrade to take place and they may believe it can cause bricked routers. First I factory reset my router, it was running the 1.33NA b01 firmware, then I firmware upgraded it to the DIR655A4_FW131RUB10 firmware file that I will make available at the end, this is a modified version of an official Russian firmware, (apparently 2 bytes is all that has been changed). Once this was complete I was running the modified firmware, as you can see it is still in English. Then I was free to upgrade/downgrade to any firmware I wished, so I decided to try the official Australian Firmware 1.21 and this worked perfectly. Here is the chklst.txt info on the firmware to prove it downgraded successfully. Update 31-01-2010: There is a new firmware version 1.33NA final that can be found here. 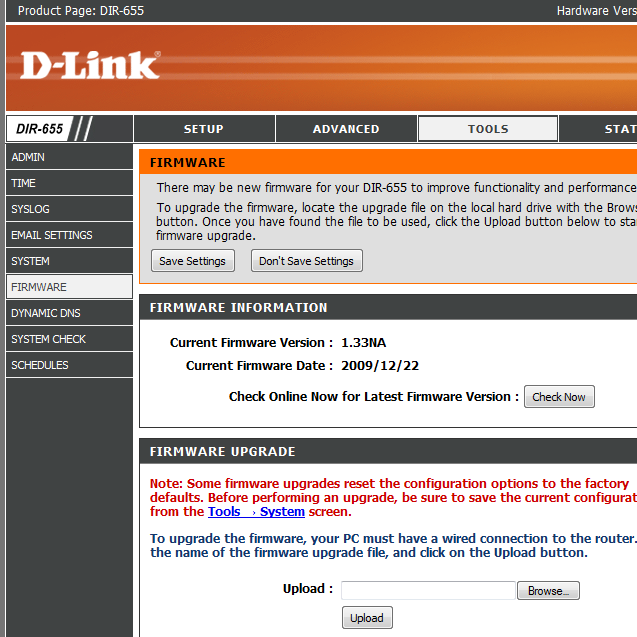 D-Link has released a new firmware for the DIR-655, version 1.33b01NA. It’s not known yet what has been changed though it appears to be working quite well for people. Remember that this is the North American firmware so while it is compatible with other countries’ hardware it cannot be downgraded to pre 1.3x NA firmware OR to any other country’s firmware, so once you go NA, you can’t go back. Please visit the D-Link forums post about it here before you install the firmware as this doesn’t have support from the usual places. Feedback can be left in this forum post. Also let us know how it goes in the comments below.